- Dow had worst August decline in 17 years and the NASDAQ its worst August in 14 years. - WTI was $44.63 and brent crude oil $48.14 on 9/11. Prices still holding 40s. - S&P trailing-12-month US corporate default rate was at a two-year high of 2.4% in August. - Blackstone agreed to acquire Strategic Hotels & Resorts for approximately $6 billion. - Box beats with $73.5M in revenue in Q2 2016, hits 50K customers. 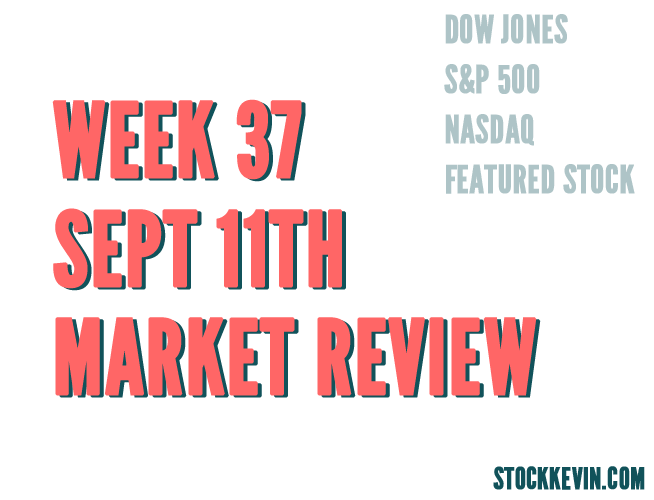 The Dow Jones Industrial Average (DJIA) closed at 16433.08, which was about a 330 point increase versus a week ago of 16102.38 on Friday, September 4th 2015. 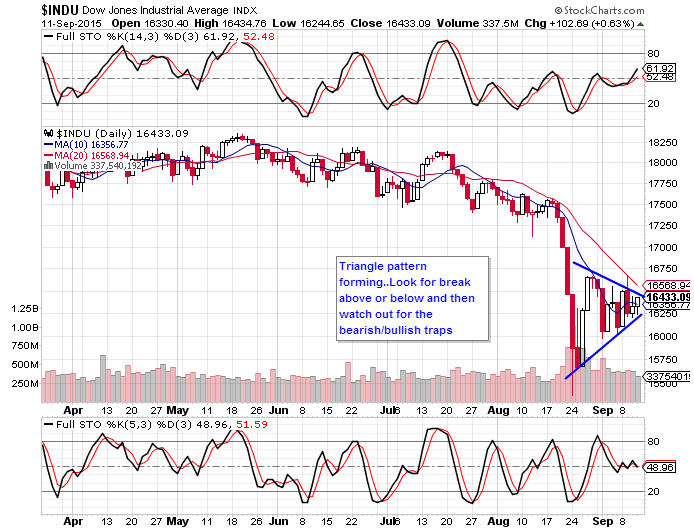 The DJIA now formed a trading triangle, which we will await to see whether it breaks up or break down. While it briefly tested the 20 DMA, we didn't see follow through action and therefore any shorts from the 20 DMA were most likely covered in the subsequent days. Right now we are pretty much in no man's land with 50/50 odds of where the market will go. 1921.22 on Friday, September 4th 2015. This was about a 40 point swing. What we saw in the DJIA is almost mirror of what we see in the SPX. A break in either direction would cause us to put our cash to work. The Nasdaq (COMPQ) closed at 4822.34 on September 11th, 2015 versus 4683.92 on September 4th, 2015. There is a bit more strength in the COMPQ versus the DJIA and the SPX. 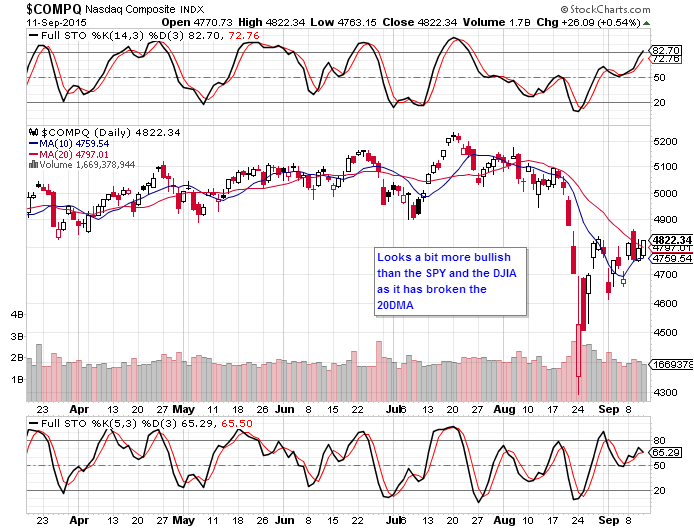 This index is definitely leaning more bullish as you can see this is the only one to have closed above the 20 DMA. We'll see if this price level holds. 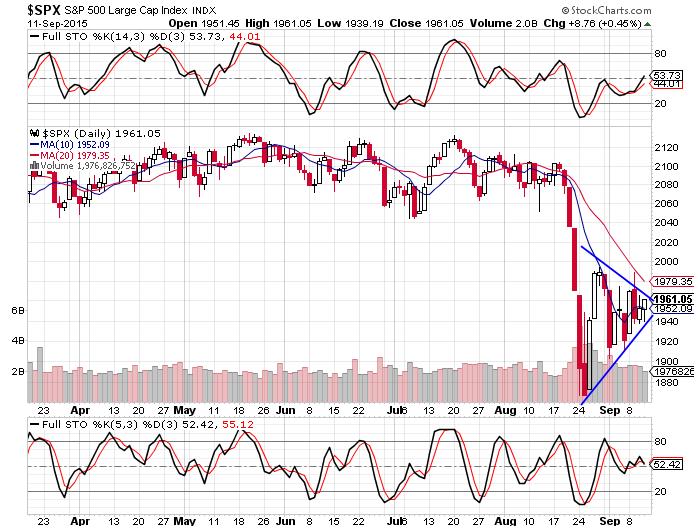 This might be an indicator that the break of the triangle for DJIA and SPX will be upward. However, we'll follow the price action and time will tell. 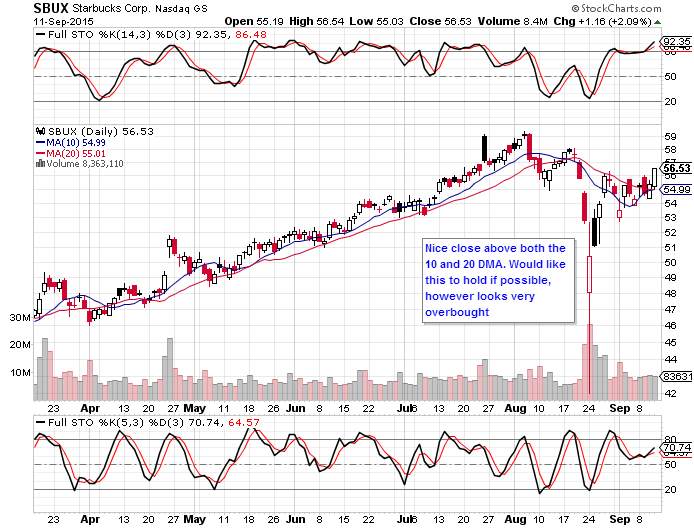 Starbucks (SBUX) is one of the stronger charts that has recovered after what seems to be a minor correction. Whether or not it holds the 20 DMA will be something to watch. Keep in mind the trendline is still broken and until another upward trend sets up, this chart is just making lower highs and lower lows. However, keep this on the watch list if the market turns bullish. 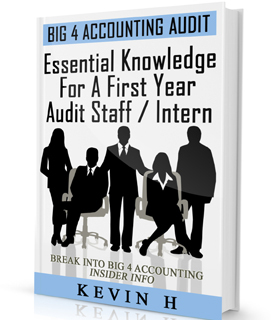 Disclosure: We did not have a position in SBUX at the time this article was first written.